That simple line hits hard. I don’t necessarily use it in context with the song but it’s deep. 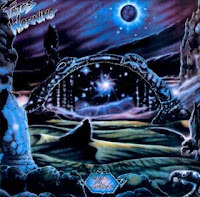 Fates Warning had a lot of stuff that just made sense, especially on the Awaken The Guardian album. This is my #3 favorite metal album of all time. I was fortunate enough to get in to Fates on the ground floor when their debut Night On Brocken came out thanks to Kelz picking it up first. Early Metal Blade Records releases gave you about a 94% chance of getting something good. Fates was one of those bands. Their first 3 LPs are great, especially Spectre Within and Awaken The Guardian. The riffs were better, John Arch’s vocal melodies were brilliant, the songwriting was consistent and the lyrics were cool. This album is brilliant front to back. There’s not a bad song on here. There’s not even a weak track. The albums brings you to emotional highs and lows. Not to many albums can do that to me. The song Guardian (see YouTube vid below) hits everything in one song. Emotion, power, sadness and then pumps you up at the end and leaves you sitting there in a cold sweat. John Arch is in my top 2 or 3 all time favorite singers ever. His work on this album is untouchable. The way he harmonizes with himself and just some of his odd phrasing blows me away. I urge you to see/listen to the other songs the YouTube user posted from this album and check the lyrics out here. Actually, just buy the damned thing if you don’t own it already. You will not be disappointed. I promise.